An independent publication designed to be of service and interest to those providing civil services related to infrastructure construction and maintenance and allied fields, including government officials, heavy/civil contractors, engineers and architects, distributors, dealers and manufacturers of equipment and materials, and professional services providers to government agencies and the construction and development industry. 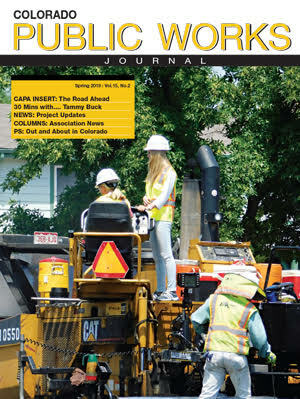 Colorado Public Works Journal delivers infrastructure news, industry trends and products to an audience of public works officials, contractors, engineers, consultants, buyers, municipal and county agencies throughout Colorado. Over 5,000 copies are mailed to subscribers with an estimated readership of 15,000 people per issue, which includes copies distributed at industry trade shows and those that read it on line. We are committed to bringing you the people, the products and the companies that drive our business and help the economy in Colorado.